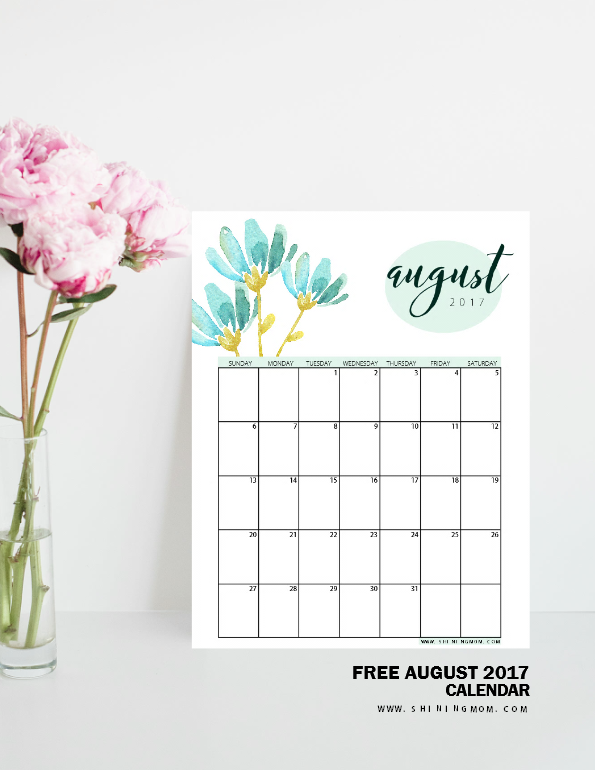 Free Printable August 2017 Calendars: 12 Awesome Designs! 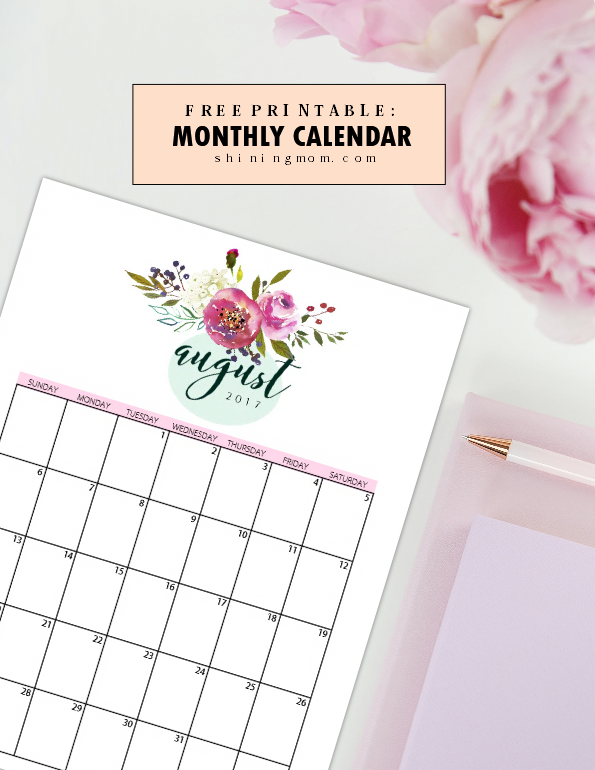 I am so thrilled to release your free printable August 2017 calendar set today! Come browse through, you’re about to enjoy a dozen of calendars that come in fun, colorful and pretty prints. 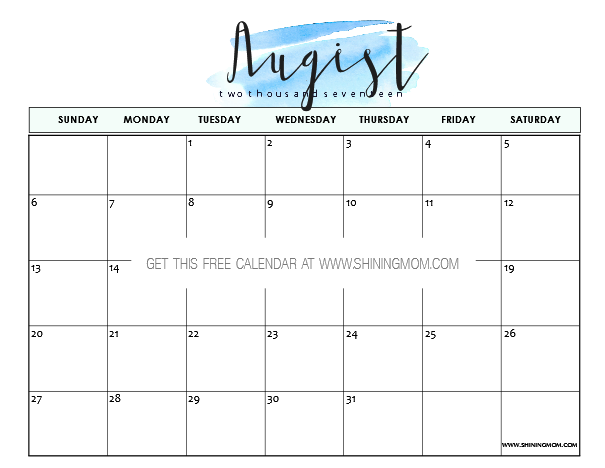 Once again, enjoy your “free monthly calendar shopping” only here at Shining Mom blog! Hi, friends! Months fly by so fast, right? As I create this post, we’re now in the midmonth of the year. 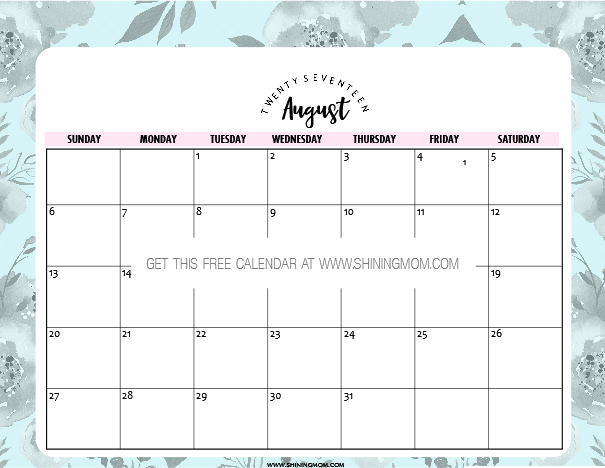 I am so glad that I was able to create your free calendars for August waay ahead which means that you, too, can plan early! Just a little trivia. 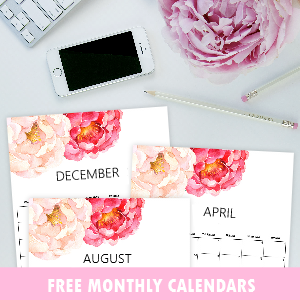 Did you know that I’ve started my monthly calendar releases since 2013? Yes this blog series has been running for quite some time now. Thanks for sticking along! 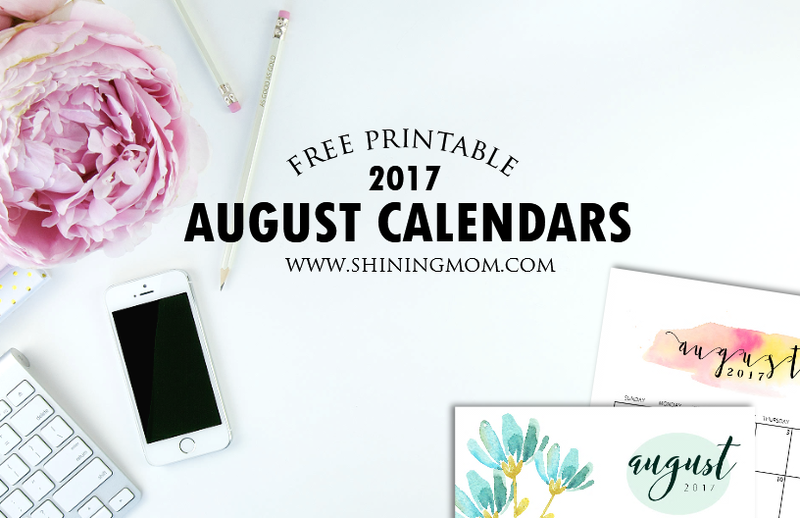 Anyway, here is a quick run down of the free calendars that you can print for free for the month of August. May these planners inspire you to set and achieve your goals! Let’s get going! How I love this first calendar design that I am presenting to you. 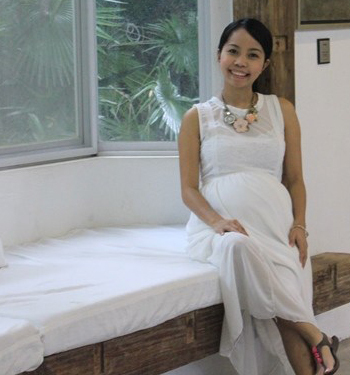 It’s so simple, so elegant, so chic. It comes in mint green floral element with a touch of gold. 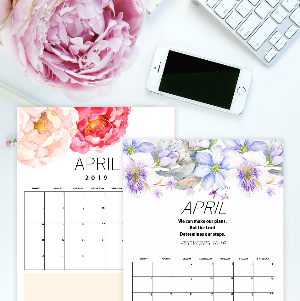 For sure, this dainty calendar will sit prettily on your desk. Use this to organize your office schedules. The second calendar design comes just as pretty as the first one. If you love the color purple with a tint of gold, I believe it won’t be hard for you to fall in love with this next one. The handpainted background is so elegant, such a masterpiece! Thanks to Creative Market for the designer’s tools that I used in this calendar and with the succeeding ones. 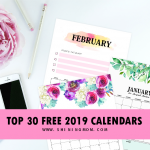 Looking for a pretty calendar to print? This 3rd calendar style has been the ultimate favorite calendar in the blog since its first release. 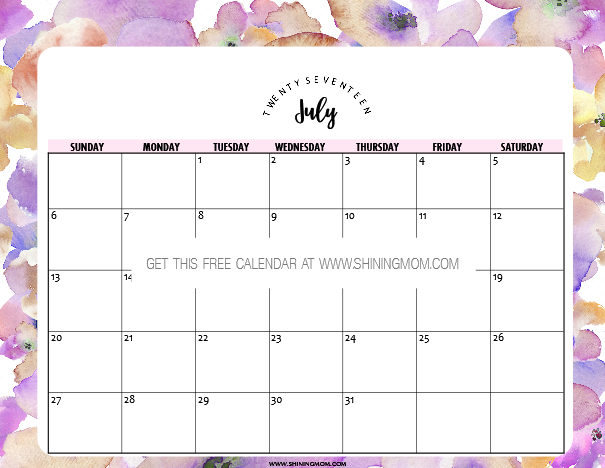 Strong, bold and beautiful, won’t this free printable August 2017 calendar inspire you to have a more productive month ahead? I strongly recommend that you print this one, it’s just that it might take up much of your printer ink. I am still not over florals yet. Still, this next deign comes in gray flower patterns and light blue background. 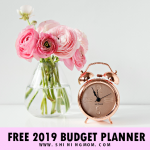 Great to use in any of your calendaring needs. I love that this particular one looks so refreshing! 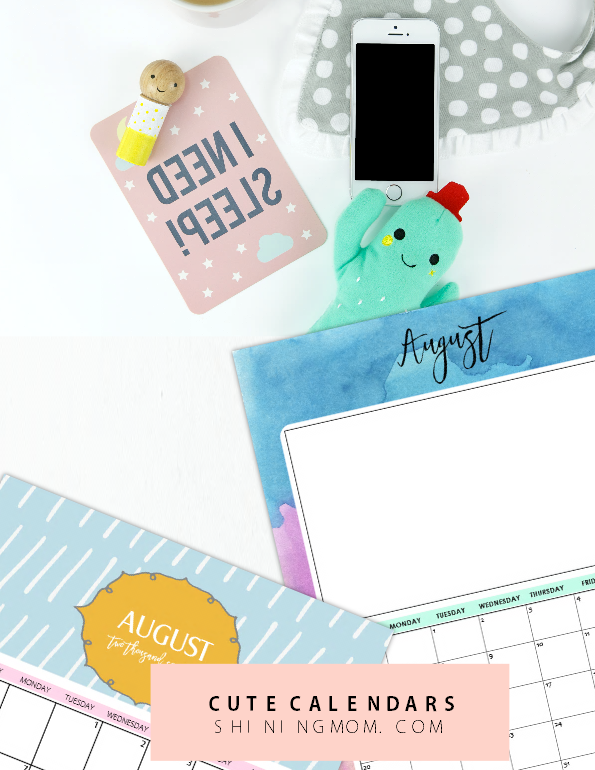 The next two calendars that I am about to show are especially deigned for the kids (and kids at heart) who like to use calendars in fun and cute prints. If you need more spaces for your monthly reminders, please know that one of the calendars as shown below has a big room for your notes! You may also opt to draw or add some photos and clippings in the box provide for. For those of you who love florals, you’ll love the next batches that I have for you. 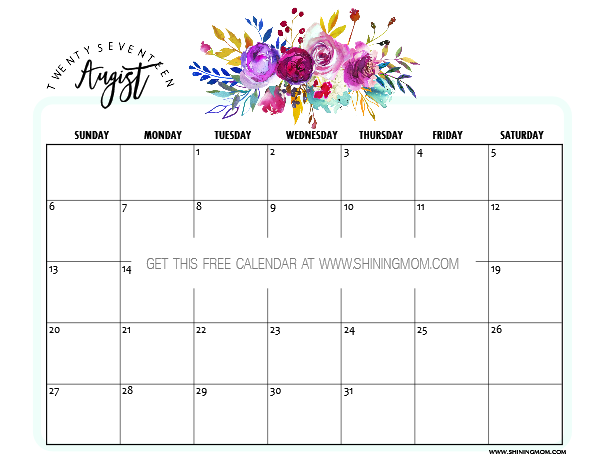 Like these next two free printable August 2017 calendars for example which both have lovely blooms. They come clean, simple and refreshing. 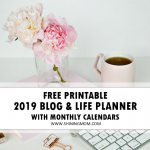 Great to use to organize your blogging schedules, meal plans and so much more! 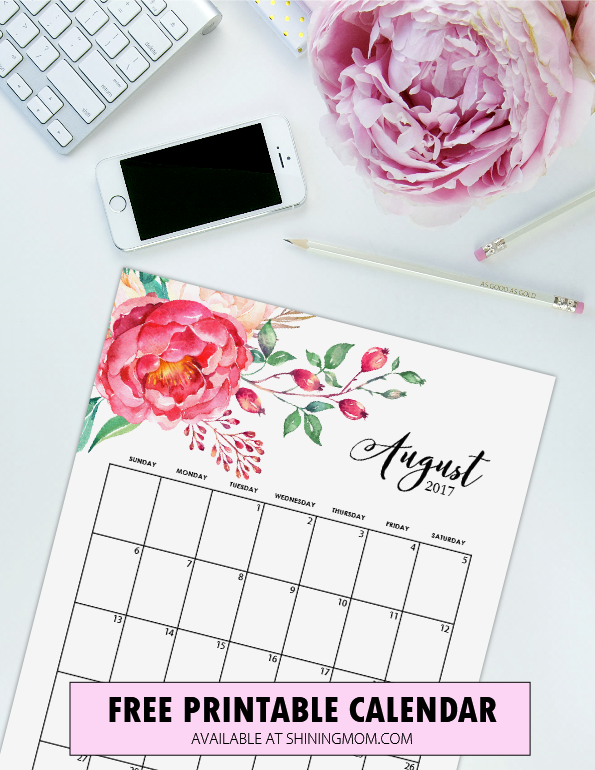 This next calendar August 2017 comes in vibrant watercolor florals! Print this out for your lady friends! 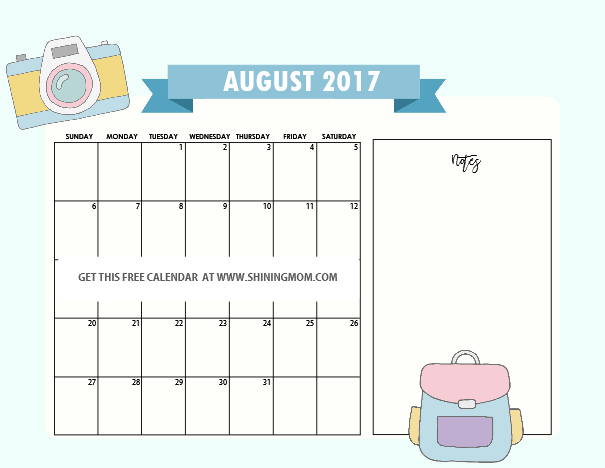 Since it’s back-to-school time in some parts of the world, I have created this cute free printable August 2017 calendar for all the school kids to enjoy. Moms, this page makes a good binder insert. 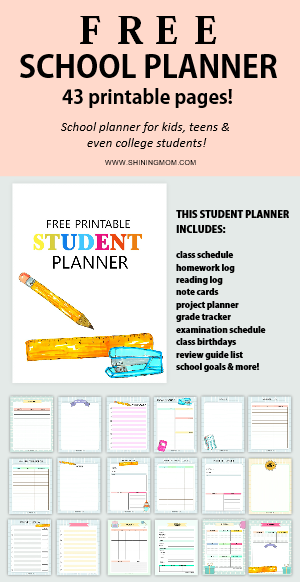 Kids can use this to organize their activities, projects or even homework in school. 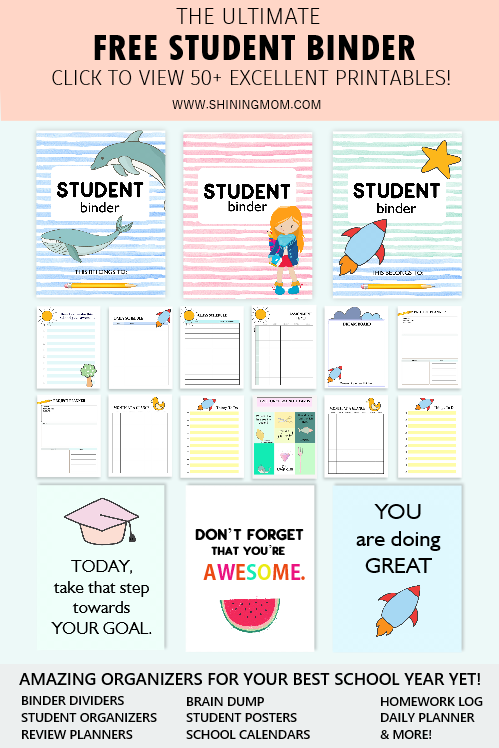 And oh, I have also released a complete student binder that you can also grab for free over here. The binder is loaded with cute and useful pages for school! The next one is still for the school kids. I believe thus cute August 2017 calendar will also be a great addition to your kiddo’s school binder. Print this page for the little ones to enjoy. It’s great to teach them how to plan at an early age. 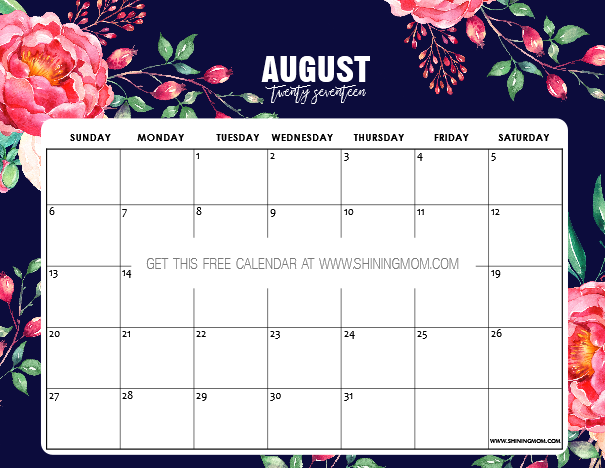 Moving on, if you’re looking for a really basic style to print this August calendar template is a great option. It comes minimalist yet pretty! Simply put, this next calendar is another design to love from this set. The last but certainly not the list is my favorite of them all! This calendar comes in gorgeous floral elements to adore. This is the calendar that I’ll be using to organize my post schedules for the blog. It’s clean with a good room for my notes. How do you find the calendars? I hope you love them as much as I do! 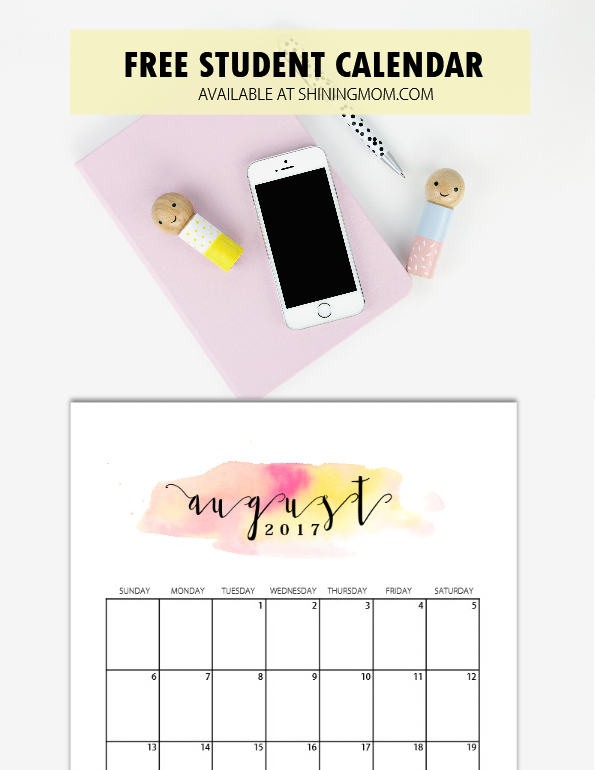 To those of you who have landed on Shining Mom just now, know that you can always get back to the blog to get your free calendars every month. It’s something that I passionately share because I love to help empowering people to get things organized without feeling overwhelmed. For this month, just go HERE and HERE to get your free calendar copies. 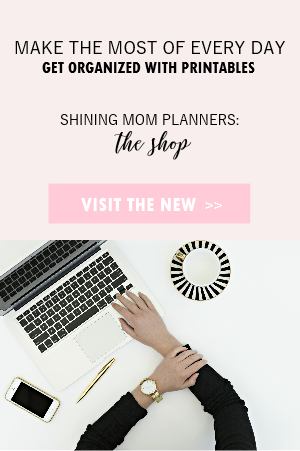 I hope they’ll help you plan an organized month ahead! 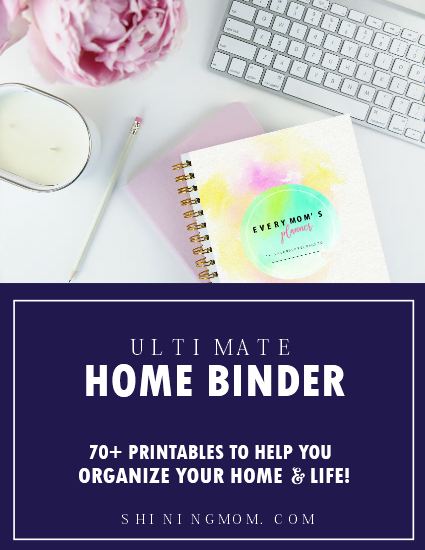 One last thing, in addition to this free printable August 2017 calendar, I’d like to share that I have previously released an ultimate binder for moms, the Every Mom’s Planner, which boasts over 70 planning pages to help Mamas manage an organized, blissful and abundant home. See this awesome planner HERE. 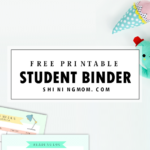 And oh, I am inviting you to stay a little bit longer on the blog and check out my current popular freebies such as the Teacher Binder and the Student Binder. 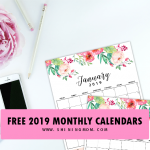 You may also join my mailing list should you like to get instant updates on the latest freebies available on the blog so you won’t miss any again! Your membership entitles you to receive my “Success Workbook”, an planner that will help you identify your goals in life. Let’s have an awesome August! Hello! I love your calendars ^^ But, why are the other calendars named AUGIST? how do I download and print these calendars??? Hi! The links are within the post. The article will direct you where you can find them. Cheers! These are so pretty! Thank you!! thank you so much! The calenders are so so wonderful! And pretty! I love them! I’m glad you were finally able to get them. Enjoy the calendars, dear!